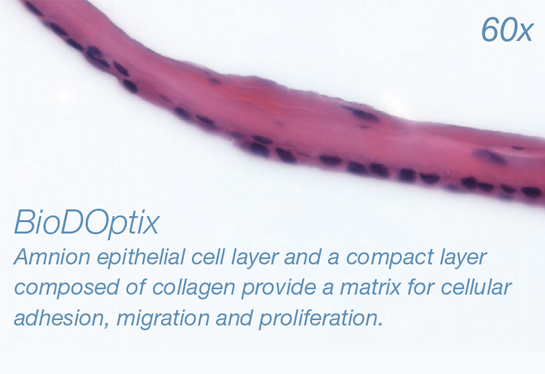 BioDOptix® is a dehydrated, extracellular membrane allograft derived from human amniotic tissue that is intended for homologous use as a scaffold for ocular tissue repair. • Circular or rectangular sizes for appropriate fit. 1. Kubo, et al. Immunogenicity of Human Amniotic Membrane in Experimental Xenotransplantation. Investigative Ophthalmology & Visual Science, June 2001, Vol. 42, No. 7. 2. Niknejad, H, et al. Properties of amniotic membrane for potential use in Tissue Engineering. European Cells and Materials 2008; Vol 15: 88-99. 3. Gruss, J, et al. 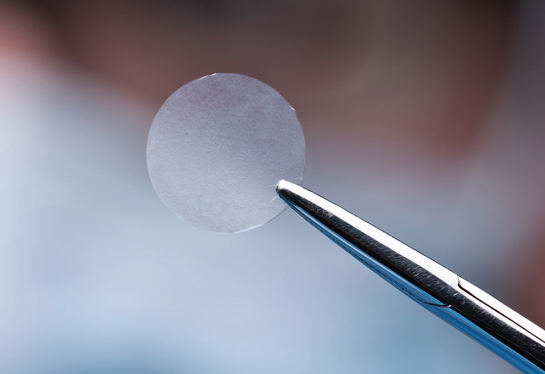 Human amniotic membrane: a versatile wound dressing. CMA Journal 1978; Vol 118: 1237-1246.